Baseball was in his blood. Joe DiMaggio the middle of three brothers all to play centerfield in the majors was a model of consistency over his 13-year Yankee career so much so he was named an All-Star in every season he played the only player to achieve the feat. A 3-time American League MVP and 9-time World Series Champion DiMaggio is perhaps best known for his 56-game hitting streak an impressive record that still stands today. A member of the Hall of Fames class of 1955 The Yankee Clipper also has his number 5 enshrined in Yankee Stadiums Monument Park. Imagine owning an entire page hand written by the Yankee Clipper containing his inner-most thoughts Steiner Sports is proud to introduce the Joe DiMaggio Diaries. From 1980-1994 The Yankee Clipper kept a private diary detailing all his daily activities. It was suggested by his accountant Bert Padell to keep this journal so he could keep track of his daily expenses. As Joe got older it was more difficult for him to keep up with the expectations and lifestyle that went along with being a retired legend. Not only did the game take a toll on his body but so did the lifestyle he lived after he left the game. Each page is written entirely by DiMaggio detailing his life after baseball. Steiner Sports obtained the exclusive rights to this historic document directly through Joe DiMaggios estate and has made it available for fans and historians to enjoy. 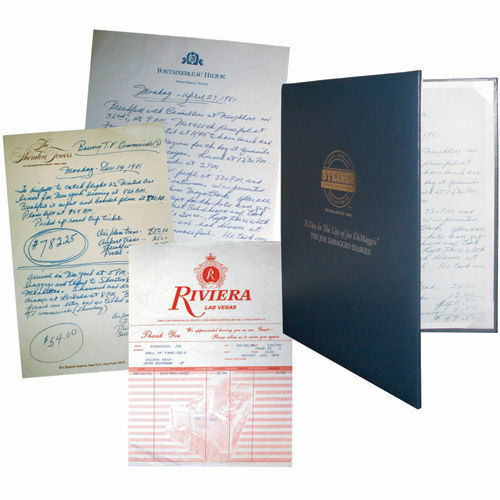 The diaries provide entrance into the unique world in which he lived and is among the most desirable DiMaggio collectibles available. Every diary page is different. Photo displayed is only shown as a sample page. Each page comes complete with a Steiner Sports certificate of authenticity. Shipping & Handling: $15 within the contiguous United States. If shipping to Alaska, Hawaii, Puerto Rico, or Canada $15 additional. For additional quantity, shipping is $10 each.